If you haven’t tried making sun prints before, now is the time! 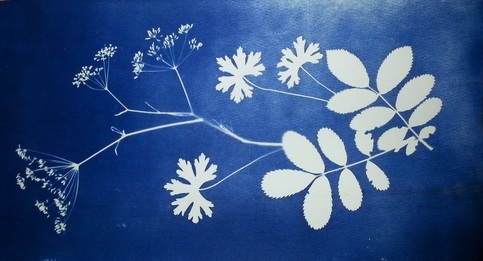 Cyanotypes (also called blueprints and sun prints) were first developed in the 1840s in England and were used to print botanical subjects. You can also make great prints using lace, doilies, paper cutouts, skeleton keys, watch parts, etc., as well as the more traditional leaves, stems, seeds, and feathers. You can also make prints from photographic transparencies. Bring a variety of objects to class to experiment with. Linda will pre-treat some specialty fabrics for us: cotton velveteen, silk, silk velvet, as well as quilting cotton. Different colors of fabric can also be used, and some of the chemical processes will allow the prints to turn to brown and ecru tones, instead of blue. (Will not work with synthetic fabrics.) Students can also bring pattern pieces so that they can cut the pre-treated fabric before exposing it to sunlight.